Marie Hebeisen, Dorothy Herbst and Loretta Ide are the only three surviving members of the Glencoe (Stevens Seminary) High School class of 1938. 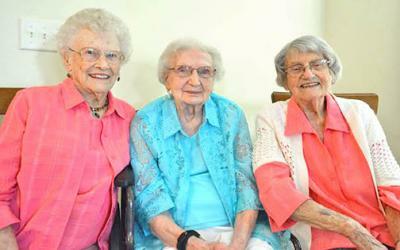 Eighty years later, they reflected on their years in school. Besides having a teacher, a desk to sit at and a pumping heart, virtually nothing was similar between the lives of 1938 and 2018 graduates. Eighty years ago, when classmates Marie Hebeisen, Loretta Ide and Dorothy Herbst graduated together, two went straight to the workforce and one went to business college for six months before joining the workforce. College was much less common, just as the diversity of jobs was much lower. A 2018 graduate who decides against the now-traditional four-year college experience (now a vastly minority choice) still has a diversity of options. Travel, trade school, internships, specialized courses, creating memes, live-streaming video games for hundreds of thousands to watch — all somehow within the realm of possibilities. Graduates today can feel perfectly liberated so long as they have a vehicle, gas money and a touchscreen. But even a vehicle was rare for a 1938 grad to own — nobody drove to school. It wasn’t uncommon to have to walk for 15 minutes to get to the bus stop. Teachers would encourage their 14-year-old students to start choosing classes relevant to their aspiring careers after graduation. English wasn’t even the primary language in Ide’s, Herbst’s or Hebeisen’s home communities. Their grandparents emigrated to America after economic hardships in Germany after World War I and pre-World War II, so German is their native language. When asked about the difference in landscape a contemporary high schooler faces, the three classmates didn’t know where to start. Affluence, technology, lunch, classes, school programs, apparel, sports — seemingly everything that could change did so. The three remember dresses being the only clothing girls wore to school, some even wearing the same dress every day. Hebeisen remembers having holes in her shoes and sticking pieces of cardboard in the holes so her socks didn’t get ruined. “We were poor, but everybody was poor. We didn’t know any better,” Hebeisen said. “Now, that would be considered poverty,” she said about her shoes. For more about the class of 1938, see the May 30 print edition of The Chronicle.